We do our utmost to produce garments with love, that are value for money. 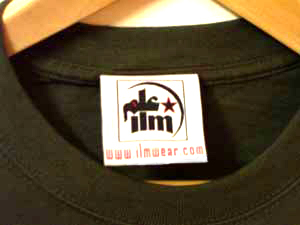 The t-shirts we use are heavy gauge, preshrunk 100% cotton; with double stitched sleeves, neck, and hem. Our labels are woven to perfection. The prints are done by hand several times over and cooked at a high temperature - to ensure that they’re long lasting. 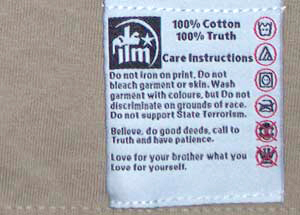 Let our care label tell you how to best look after yourself and your garment. For all you Skaters, Hip-Hop heads and people that like to hide your modesty, we suggest ordering a size bigger and allowing all that tucking your shirt in jazz – because it’s just more comfortable like that, isn’t it?!! If you’d rather keep your Moms happy and wanna avoid her telling you that you look like a refugee; then go right ahead and order the size that you think you are. But, if you’re one of those skinny dudes or body beautiful cats, that likes spray on clothes and the whole world to see what God gave you, then order a size smaller than you are. The choice is yours - if you’re happy, then we’re happy! Just to remind you all: we've designed virtually all garments as unisex; so that anybody can wear them - man, woman or monkey. Now some of you Sisters that wear long sleeves and cover your hair have enquired about us producing more long-sleeved items. - Wear the looser fitting items out and about (maybe even ordering a size up) and put a long sleeved top underneath. The beauty of this is that you can do things like colour co-ordinate with your headscarf, which looks cool - 'cos the layered look's in!